Appreciation is a proven motivating factor for every human being, and thus, every employee. However, this seemingly easy way to boost employee morale is often overlooked in the hustle and bustle of work life. This article shows how it’s possible for companies of all sizes to successfully recognize their staff and reap the benefits of a boost in staff morale, retention of exceptional employees and increase in profit. Another study reported 65% of Americans surveyed received no recognition in the preceding year. Still another survey also reported 85% of employees feel overworked and underappreciated. To frame it plainly, employees desire more recognition than they are currently receiving. 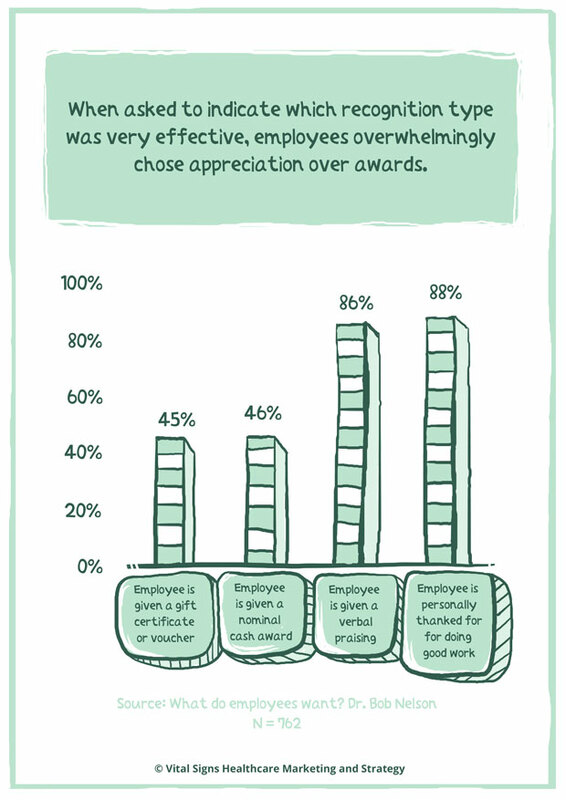 So, how would putting effort into recognizing employees help your business? For one, studies have shown that for every 10% increase in recognition, the engagement, commitment, and intent to stay scores significantly higher. An increase in each of those scores leads to higher productivity and a much more efficient work environment. In a new culture where the talent market has switched, the employer is now responsible for “selling” their company to potential employees. With 32% of US workers seriously considering leaving their organization (39% increase from 2005), staff recognition is more important than ever. One of the components future employees look for is a culture of recognition, which doesn’t have to be flashy, complicated, or costly. Because of the increase in quality and height of education, employees have every right to ensure they will be happy in a workplace and find a place in which they belong. A “once off push of appreciation” isn’t enough to truly boost company morale and keep employees happy – an in-depth culture of recognition must be intentionally created, nurtured and widely and consistently used to create tangible business benefits. Regardless of the size of your staff, my goal is to help you understand the ways recognition can benefit your medical centre and explain how expressing appreciation will work best in your company. Employee recognition is the acknowledgement of an individual or team’s behavior, efforts, and accomplishments that support the organization’s goals and values. Acknowledgment encourages engagement among peers and coworkers, which leads to an increased bond throughout the entire team. Because of this bond, your company can work efficiently, increasing productivity and improving end results. As an employee begins to feel more recognized in the workplace, his intent to stay increases dramatically. Thus, if he has been made to feel useful and appreciated all along, he is more likely to produce quality work and remain loyal to your company. Recognition is the driving force behind ingraining company values, supporting business goals, and attracting top talent. If a business is going to prove successful, the values of the company must be reflected in every employee. By rewarding, recognizing, and appreciating company values exhibited by certain employees, you increase the chances of fellow coworkers taking notice. Reinforcement and encouragement of these behaviors clues the rest of your workforce in to the kind of behaviors and ethics that coincide with your company culture. According to Globoforce, 79% of employees felt that recognition gave them a better understanding of the company’s objectives and goals. Almost all employees whose companies reward value-reflected behaviors feel that they have a strong grasp on the goals and objectives of their workplace. In 1982, the value of publicly traded companies was made up of 62% tangible assets (machinery, office buildings, etc.) and 38% intangible assets (people). 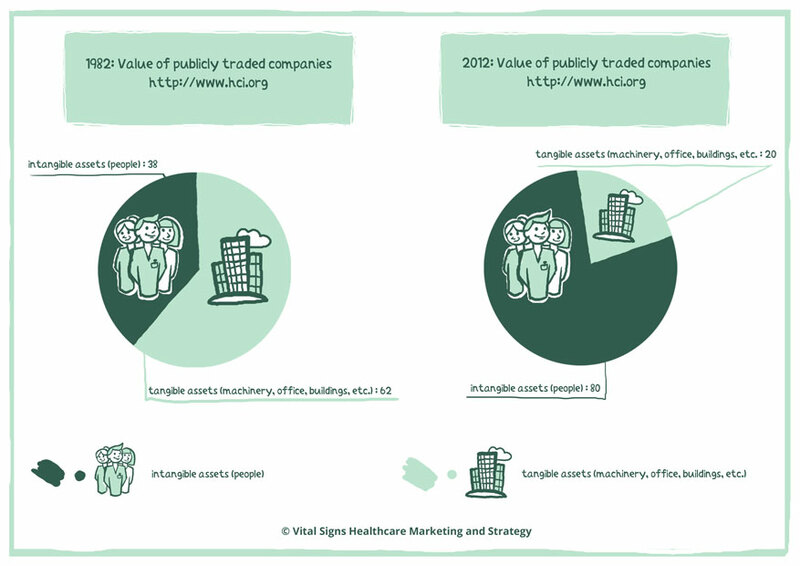 As of 2012, the value of publicly-traded companies was made up of only 20% tangible assets and 80% intangible assets. It’s easy to see the shift. Who you hire and retain is now your most important asset. How do you keep vital assets? You appreciate them. This becomes especially important in healthcare related industries where the entire operation relies on the behavior and attitudes of the employees (rather than a piece of machinery). Likewise, in the service industry, the staff must feel recognized and important to be able to serve to the best of their ability. As the value of an organization increasingly depends on intangibles, organizations must make themselves attractive to employees – their most valuable asset. Almost half of all workers said they would leave their current job for a company that clearly recognizes their contributions to the company. Thus, a company must take care to create a brand that is attractive to employees – and a culture of recognition is a key element to that brand. Translation? If your company does not take the time to recognize the efforts of your employees, you will find yourself either significantly under-staffed or equipped with a staff of extremely unhappy people – neither of which is a “win” for your business. Recognizing your staff can lead to the attraction and retention of high-level workers. One thing potential employees look for is a culture of recognition and appreciation. In fact, 79% of employees who quit their jobs cited a lack of recognition as a key reason for leaving. Without committed workers who are happy with their jobs, a company cannot expect to grow or maintain a competent staff. Organizations with a culture of recognition have employees who report they are 7 times more likely to stay with the company and 11 times more likely to feel completely committed to their jobs. Additionally, Kelton Research has stated that half of Americans agree that besides the standard compensation and benefits, being appreciated is what motivates them to stay in their current position. Quite simply, happier workers lead to a happier environment. And a happier environment will lead to a successful business. Companies whose employees received recognition or praise for doing good work in the last seven days had 10% to 20% higher productivity results. An average annual increase to operating income of 19.2% was shown in companies employing some sort of recognition system. Companies with low engagement lost 32.7% of operating income. Low appreciation companies held an average of 6.19 absent days per year. Thus, it has been proven that greater recognition correlates with higher profits. 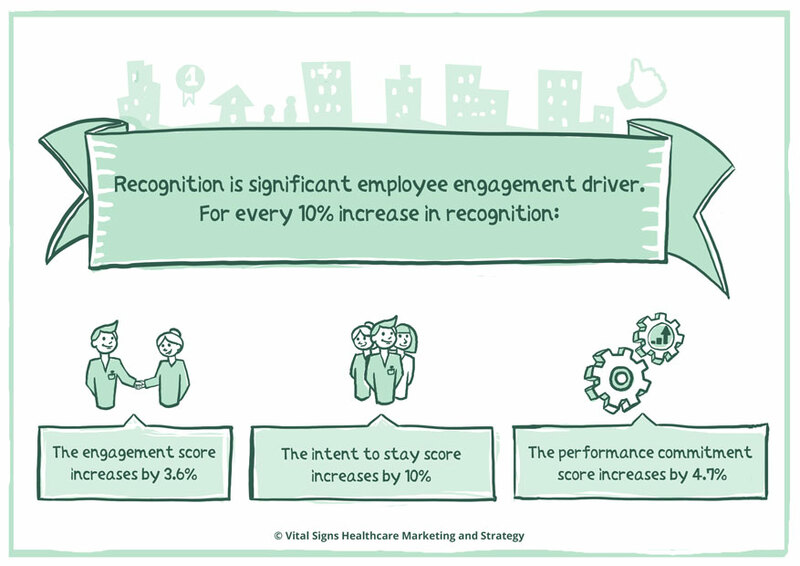 Recognition is also a significant employee engagement driver. For every 10% increase in recognition, engagement scores increase by 3.6%, content in staying scores increase by 10%, and performance commitment scores increase by 4.7%. How Does Your Company Get There? So, how do you begin implementing staff recognition? Start small and simple – this doesn’t have to be a difficult or huge undertaking as the benefits will build and compound over time. You first have to create a culture of recognition within your company. Inspire your entire staff to encourage one another and create an environment built on encouragement and appreciation. It costs 8% of an employee’s salary to change behavior with a cash reward. It costs 4% of an employee’s salary to change behavior with a non-cash reward. Over 80% of people admitted that they would rather have received a verbal compliment or “thank you” from their manager than a cash-reward. While many will still claim they would rather have cash, cash does not motivate – recognition, however, does! First, Dr. Bob Nelson suggests several low-cost ideas such as; you can show your appreciation by means of a verbal thank-you or affirmation – this method is extremely affective and is guaranteed to boost morale. Giving small gift cards when goals are met is also a kind way to show appreciation; however, a $20 gift card holds an entirely different meaning than a $100 gift card. Be sure the amount of the card directly correlates to the praise you are offering. Another simple way to engage your employees is to ask them straightforward questions. Inquire what they want from their job. What are their goals? Hopes? Dreams? Ask your staff what you can do to assist them in achieving those goals and dreams. Investing in your staff’s personal and professional growth is a fantastic way to engage your staff. A leader should dedicate themselves to growing their employees’ skills and truly teaching them how to improve on their job. This can include a book allowance, a new skills course, or any recertification courses. Employees like to climb the ladder and enabling them to do so is key to building professional relationships. Of course, providing benefits and medical insurance is also important to every single member of a team. Providing medical, dental, even a massage medical plan makes employees feel valid and safe in the work environment. Not only do they benefit, but their families do as well. Whether they like to admit it or not, people need to be challenged to rise to success. Coaxing staff out of their comfort zones is another responsibility of a leader. Granting more responsibility to the employee will make them feel important and an integral part of the team. On the same stream of thought, you should ask and listen to your staff’s input. It’s a proven fact that people stay loyal to what they help build. Ask them how they believe they can increase revenue or decrease costs. If their contributions prove valuable to the company, recognize their input and celebrate their successes. Tying ownership into a staffer’s job is another way to engage your staff. Whether this comes in the form of a profit share or responsibility over a department or activity, this can be a challenge in and of itself. Of course, providing incentives is the most common form of staff engagement and recognition. As long as the incentives align with the business’s priorities, exceptional behavior should lead to higher incentives and rewards. The key to this form of recognition is to understand the difference between normal, good, and exceptional behavior. All of this information proves that it is in every company’s best interest to prioritize the creation of a recognition culture in the workplace. The benefits of recognition culture vary from financial, such as increased productivity, profitability, and employee engagement; to organizational goals and values that will become ingrained in an employee’s work ethic and performance. By creating a more compelling employee value, your company will be able to attract the top talent in your field – and be able to retain them. Overall, the qualitative and quantitative information demonstrates that staff recognition is not only a financially smart business decision within our company but also helps us to become a more attractive employer to both candidates and current employees. Remember… A “recognized” team is a loyal team. 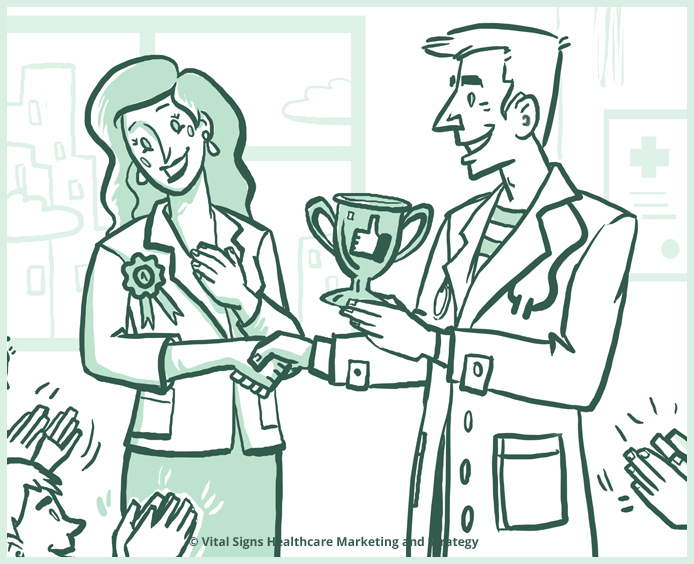 What are some of the ways you show recognition at your healthcare center? “Changing Rules of Engagement.” Inside Employee’s Minds (2011): n. pag. HRE Online. Mercer, June 2011. Web. 19 July 2015. <http://www.hreonline.com/pdfs/07012012Extra_Mercer.pdf>. “Employee Recognition and Rewards Policy.” Employee Recognition and Rewards Policy. N.p., n.d. Web. 9 June 2015. <http://hr.mcleanco.com/research/hr-employee-recognition-and-reward-policy>. “Gender in Recognition — Key Findings.” P&MM Motivation (n.d.): n. pag. Staff Motivation Matters. P&MM Motivation, 2013. Web. 19 July 2015. <http://staffmotivationmatters.co.uk/wp-content/uploads/2014/04/Gender-In-Recognition-Analysis.pdf>. “Human Capital Institute.” Strategic HR Training and HR Conferences. Human Capital Institute, 2015. Web. 19 July 2015. <http://www.hci.org/>. “Kelton Global.” Kelton Global. Kelton, 2015. Web. 23 July 2015. <http%3A%2F%2Fkeltonglobal.com%2F>. ITA GROUP. “Trends in Employee Recognition.” World at Work. N.p., June 2013. Web. 8 July 2015. <http%3A%2F%2Fwww.worldatwork.org%2FadimLink%3Fid%3D72689>. McLean & Company. “Create a Culture of Recognition to Drive Engagement, Improve Retention, and Increase Profitability.” HR McLean & Company. InfoTech Research Group, n.d. Web. 18 July 2015. <http%3A%2F%2Fhr.mcleanco.com%2Fresearch%2Fss%2Fcreate-a-culture-of-recognition-to-drive-engagement-improve-retention-and-increase-profitability>. Nelson, Bob. “Low Cost Recognition Ideas.” Low Cost Recognition Ideas. N.p., n.d. Web. 9 June 2015. <http://www.drbobnelson.com/site/ideas>. Rath, Tom, and Barry Conchie. “How Full Is Your Bucket? Research.” Gallup Strengths. Gallup, n.d. Web. 8 July 2015. <http://strengths.gallup.com/114088/Full-Bucket-Research.aspx>. Saunderson, Roy. “Top 10 Trends for Employee Recognition in 2013.” : Incentive Magazine. N.p., 10 Dec. 2012. Web. 9 June 2015. <http://www.incentivemag.com/Strategy/Ask-the-Experts/Roy-Saunderson/Top-10-Trends-for-Employee-Recognition-in-2013/>. “SHRM/Globoforce Survey: Employee Recognition Programs, Spring 2013.” SHRM/Globoforce Survey: Employee Recognition Programs, Spring 2013. N.p., 29 May 2013. Web. 9 June 2015. <http://www.shrm.org/research/surveyfindings/articles/pages/globoforce-employee-recognition-program.aspx>.